While I cook primarily from scratch, I can appreciate a good cooking shortcut—especially when it’s 5 o’clock on a Tuesday and my children begin to swarm the kitchen in search of dinner. These shortcut enchiladas have become one of my family’s favorite weeknight dinners. Rotisserie chicken and store-bought sauce (I try to choose a good-quality one without preservatives) make it possible to have them out of the oven and on the table in under an hour. Get The 8×8 Cookbook on Amazon! To request reprint permission or hi-res images, please contact Kathy Strahs at kathy@burntcheesepress.com. Bring a small pot of water to a boil over high heat. Add the onions, bring the water back to a boil, and let the onions cook for about 15 seconds (this will take away some of the onions’ “bite”). Drain the onions and set them aside. In a large nonreactive bowl, stir the vinegar, brown sugar, salt, and allspice until the sugar is dissolved. Add the onion slices and stir to coat them thoroughly in vinegar and seasonings. Cover the bowl and refrigerate the pickles while you prepare the enchiladas*. In a large bowl, combine the chicken and half of the cheese. 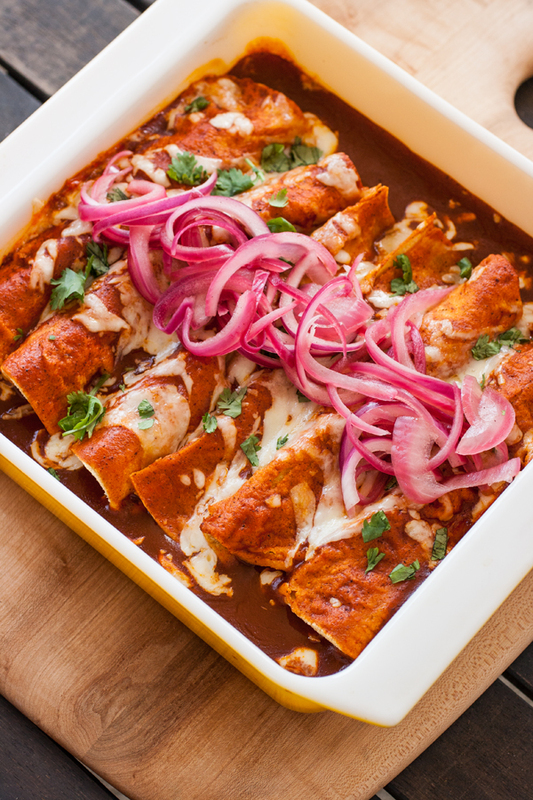 Pour ½ cup of the enchilada sauce into an 8x8-inch glass or ceramic baking dish. Wrap the tortillas in a clean damp towel and microwave them on high for 30 seconds to make them roll more easily. Add about ½ cup of the chicken and cheese mixture to the center of a tortilla, roll it up and place it seam side down in the baking dish. Repeat for the remaining 5 tortillas. Pour the remaining 1½ cups enchilada sauce over the top and sprinkle with the remaining cheese. Bake until the cheese is melted and lightly browned, 20 to 25 minutes. Serve topped with pickled onions and chopped cilantro. * The pickles should stay fresh, refrigerated in an airtight container, for about 3 weeks.